As you'd expect, there was quite a lot of news once the embargo was lifted. The official BBC version was still a bit late to the post. 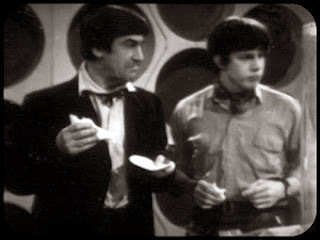 The Radio Times had DW stalwart Patrick Mulkern write two articles, one a standard enough press release and the other an excitedly fannish article that provides a good summary of the whole affair, should anyone on this site desire one. He wants to believe there's more episodes out there as much as the next fan, but if there are any no one's told the Times yet. "As long as I have been a Doctor Who fan there has been one story I hoped and prayed and begged I would one day see again," he said at a BBC press launch unveiling the recovered episodes on Thursday. 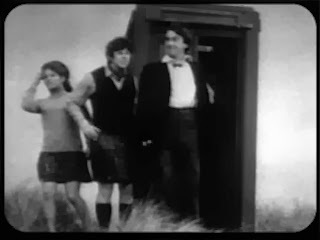 "The Web of Fear is the quintessential Doctor Who story, it is the most British thing you could imagine. I never thought I'd see the day, I can't really believe it. To think it was just gathering dust on a shelf." Gatiss added that six-parter's London Underground setting had such a profound effect on him when he saw it as a child that the first episode of the next series of Sherlock will be set there. "The first epsiode of Sherlock, because I am obsessed with the tube and I think it all comes from that story when I was a kid, is explicitly about the London Underground for exactly that reason...This is such a gift in this anniversary year. It is amazing timing, exciting. Anything is a bonus and the rest is gravy." The Mirror has a video interview with Frazer Hines and Deborah Watling, in which they talked about how they didn't believe it was real any more than the rest of us, at first...the Telegraph's write-up was pretty much what you'd expect, but then they did a jolly episode review. The Independent was mundane, although they included that joke about 60s license fee payers. The Metro covered it (well, considering one of them was "Web" it was almost their job to). And the Daily Mail went for photo-heavy coverage. Very pretty photos, though. Outpost Skaro has posted about the experience of the press conference itself (Hines, Watling, and Mark Gatiss. Ignore the typo for Padbury.). Two takeaways, they've said: one, there's probably more to come, two, anybody who says so is jeopardizing future deals and fans shouldn't rock the boat by speculating. Quite why speculating is damaging is itself a matter open to speculation, as any coherent answer from the BBC on this point would probably itself be more damaging than any speculation. Presuming that there is an actual danger from fan speculation, that is. And finally, because no one will ever again remember these exist...have a look at the lovingly-crafted BBC photonovels for Enemy and Web, from back when James Goss was running the DW website and it was still that blue-green colour. They're honestly very sweet.